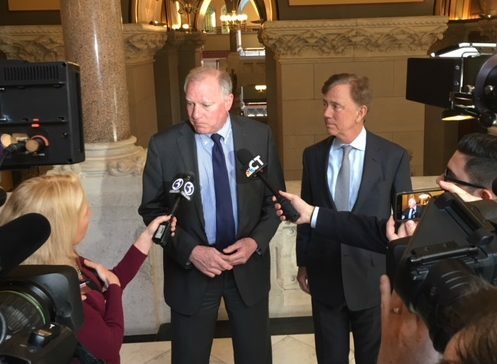 George Jepsen, left, and Ned Lamont. Attorney General George Jepsen, who backed Ned Lamont’s challenge of U.S. Sen. Joseph I. Lieberman in 2006, is endorsing his candidacy for governor, the Lamont campaign announced Monday. Jepsen, a former Democratic state chairman and state Senate majority leader, is not seeking re-election to a third term. He backed Gov. Dannel P. Malloy over Lamont in the 2010 gubernatorial race, but had decided weeks ago to endorse Lamont before the Democratic convention in May. Lamont and Jepsen met with reporters after the announcement. “My hope is my endorsement will help bring other Democrats off the sidelines,” Jepsen said. “It’s a big plus,” Lamont said. Malloy is not seeking re-election. Lamont’s competitors for the Democratic nomination include Hartford Mayor Luke Bronin, former Secretary of the State Susan Bysiewicz, Bridgeport Mayor Joseph P. Ganim and Jonathan Harris, a former state senator and executive director of the Democratic Party. Bronin and Bysiewicz are raising money through exploratory committees. Ganim, Harris, former Veterans Affairs Commissioner Sean Connolly and Guy L. Smith IV, a retired business executive, are declared candidates.